How can the latter stages of patients’ hospital stay function more effectively to improve patient experience within the ward, encourage confidence on discharge and improve long term outcomes? The Outcomes Framework, the need to improve efficiency – length of stay is a major cost driver, and the move to make hospitals responsible for patients for 31 days after discharge by not paying for readmissions within that period are focussing attention on the need to improve recovery, rehabilitation and re-ablement across health and social care. This applies to those people coming to terms with starting dialysis or starting immunosuppression for vasculitis, those recovering from acute kidney injury (AKI) or after a transplant as much as people entering rehabilitation after a heart attack or stroke. Rehabilitation is “an active process by which a person temporarily or permanently disabled by injury or illness is restored to the optimum level of physical, psychological and social function in the context of their previous life and personal experiences. Whenever possible this includes return to chosen or necessary paid or unpaid work and leisure activities”. Reablement is the latter part of that process – the return to “normality”. This is a big issue. The NHS Institute for Innovation and Improvement estimate that on any one day, 25% of all acute hospital inpatients have no clinical need to be there. My impression visiting kidney wards up and down the country is that things have improved but that there are still too many people in bed when they could be sitting out, too many without their own clothes and still a lot who could be at home if social care and support were in place in a timely fashion. A range of recent national audit office reports have identified a lack of well co-ordinated responsive rehabilitation as a common theme. “Although rehabilitation may help to reduce length of stay, minimise hospital re-admissions and reduce the use of NHS resources following the initial period of hospitalisation, it has not been considered to any great degree by Strategic Health Authorities in their reviews of major trauma services”. “One of the main barriers to more effective stroke services is the persistent failure of health and social care to work effectively together”. 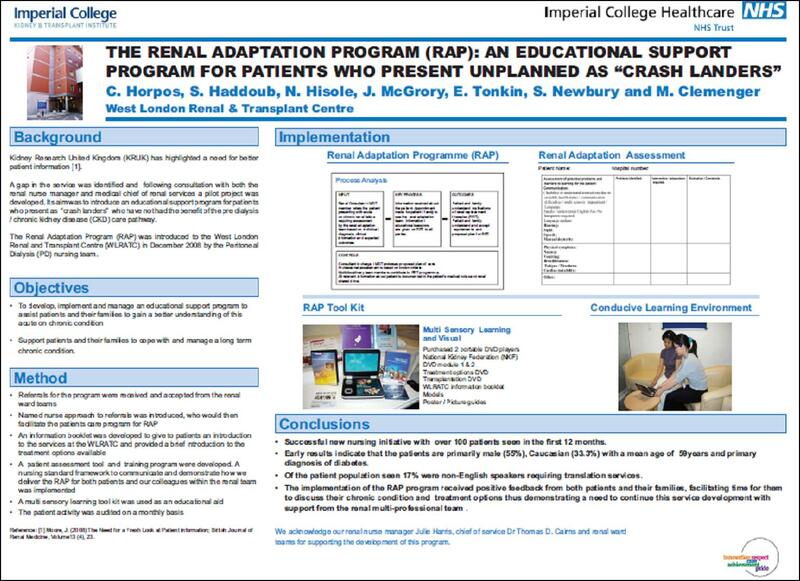 The Renal Adaption Programme at Imperial College Healthcare is a nurse-led initiative that was set up by Michelle Clemenger and the peritoneal dialysis nursing team at the West London Renal and Transplant Centre in December 2008 to support patients arriving for dialysis in an unplanned fashion who hadn’t had the benefit of pre-dialysis education from the CKD team. The educational support provided to those who present late or unplanned with acute or chronic renal failure provides information and advice about all the treatment options available including home dialysis and the goal is to see people within 48 hours of referral by the ward team. This is followed by education and support over a minimum time period of 6 weeks to help the patients and their families through the changes ahead giving both psychological and educational support. The team uses a range of mutli-sensory learning tools as an aid to deliver the educational support and information. They have also put together a renal adaption programme toolkit including a tailored DVD that’s easy for people to watch whilst on haemodialysis and in the evening with their family who might not be able to visit during the day. A focus on rehabilitation and developing similar support programmes replicating Michelle’s ideas and materials will improve choice, share decision-making and almost certainly save money by reducing length of stay and increased uptake of the less expensive home dialysis modalities.